Review: "Budjana, Dewa: Joged Kahyangan" - Sea of Tranquility - The Web Destination for Progressive Music! I don't often have much to say when it comes to CD packaging; we usually listen to downloads in order to write reviews and that's fine by me. 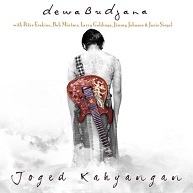 I did receive a physical copy of guitarist Dewa Budjana's fourth CD Joged Kahyangan and I am glad I did. In a jazzy tradition, there is a lengthy essay inside the cardboard sleeve that discusses the artists and songs on the recording. I haven't often pondered the jazz scene in Indonesia; after reading about Budjana and his efforts to reach an audience outside his home-country and how he has lined up with American musicians I am enlightened and can listen with an informed ear. This is composition-oriented jazz with guitar as opposed to a pure jazz-guitar recording. Many instruments appear in every song including, piano, synth, vibes, clarinet, saxophone, and a guest vocal by Manhattan Transfer's Janis Siegel. There aren't any free-jazz freakouts but there are a few choice solos. Track three, "Dang Hyang Story," features great piano and guitar solos, not to mention the cool way the bass notes move under the melody. I almost skipped "As You Leave My Nest" as I wasn't feeling the vocals but Janis was chosen on purpose. Her tone and style along with the fantastic way she harmonizes with her own voice is really a nice break after three instrumentals. A nice dirty guitar solo is taken in "Majik Blue" before a smooth bass solo. The jazz melodies in each tune and basic jazz song structures aren't groundbreaking but the production is so clean that every instrument and rim shot is clearly audible. "Erskoman," a tune written for drummer Peter Erskine who plays on the whole CD features excellent Hammond organ playing and a tasty drum solo. Of note is the guitar processing on this track, sounding something like a Evantide Harmonizer or some such gadget. To sound painfully American, Joged Kahyangan doesn't sound like a jazz record made by a southeast Asian musician, nor is it a deluge of jazz guitar flash. Some may consider this too close to easy-listening jazz but I believe there is more substance here than that.